I asked Abeer if some time, she would like to guest post one of her masterpieces one day here. Yes, I did say masterpiece because Ms Abeer is. an. absolute. artist. I do not even know where to begin with her decorating skills, baking and cooking skills and the fact that everything she makes could be put up on display in some high-flying location. Hey guys! I am Abeer, the face behind a little blog called “Cakewhiz- A Cake Geek’s Resource.” I love dressing up my desserts and making them look pretty, especially CAKES! When Uru asked if I could possibly do a guest post for her, I was quite taken back coz her recipes are to die for! Seriously, I go into a chocolate-induced coma (the good kind) every time I visit her blog. But, she is such a darling that I had to go an extra mile with the recipe I am sharing today. I only hope my chocolate spinach cake with leaf prints is just as good as her fantastic recipes! The inspiration for making leaf prints on a cake came quite randomly…I was preparing dinner and god knows why, I stopped to admire the veins and intricate details on a mint leaf. I am odd like that … I tend to zone out every once in a while…hehehe. I do have to admit that making these prints brought back memories from my childhood. You see…as a kid, I used to enjoy making leaf prints on poster boards and in one unfortunate incident, I even made leaf prints all over the house walls…hahaha. Needless to say, my parents were pissed… hahahah. I made this cake for a friend’s party and on my way there, there is a beautiful park. So, I stopped to take photographs. If I wasn’t running late, I would have taken some pictures of this park as well. The scenery there was just breath-taking. They even had this old-fashioned water pump or maybe it’s a water fountain… it was pretty neat! Like I mentioned earlier, underneath all the decorations, you will find a delicious chocolate spinach cake. You must be thinking I am out of my mind for making such an odd cake. But honest to goodness, it is unbelievably delicious! It’s very rich with a strong chocolate flavor AND the best part is you you can’t even taste all that spinach. 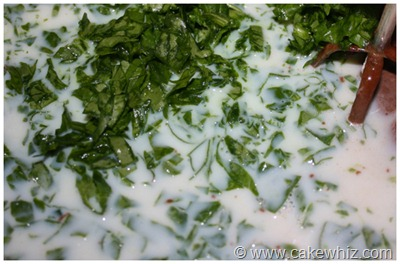 Add finely chopped spinach and hot milk. Mix again. 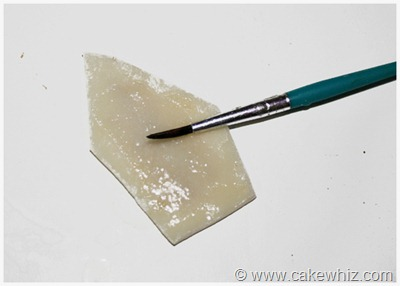 Dip your paintbrush in some edible color (I used Wilton’s fondant colors… they are very concentrated and work nicely). Now, brush this paint onto your mint leaf. 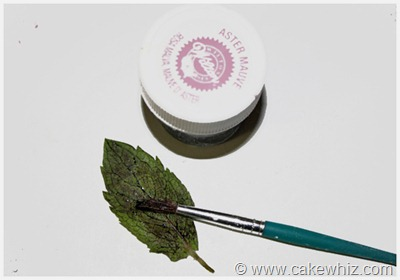 You will need to use different mint leaves for each color that you use. Also, make sure you have a few mint leaves handy coz after brushing paint on them multiple times, they get very limp and tear easily. Roll out some white fondant and sprinkle powdered sugar to prevent sticking. Make sure you don’t roll it too thin. I kept it quite thick. 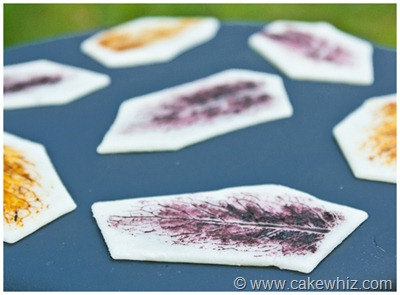 Press the painted leaf onto this fondant gently. 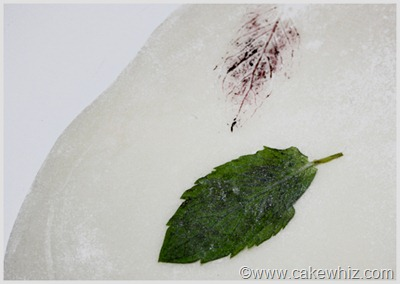 Now, carefully peel the mint leaf away from the fondant and you will see a leaf print. Do this as many times as you need to and in different colors. Then, use a pair of scissors and cut around each leaf roughly. No need for accurate cutting… it looks better slightly jagged. 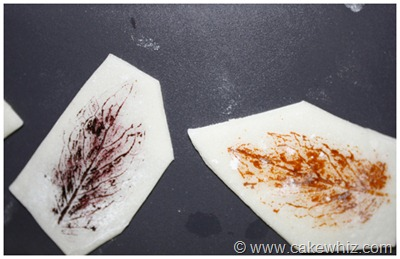 **TIP: After making leaf prints on a sheet of white fondant, let it just sit on the table for an hour or so. 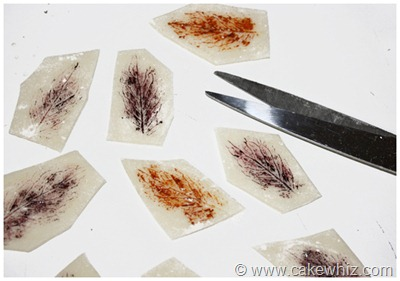 The air dries up the fondant a little and cutting it becomes easier. 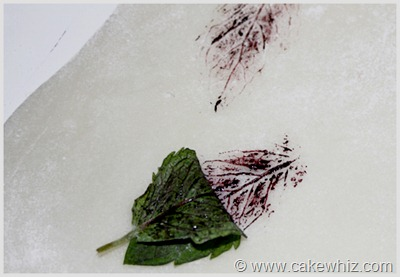 To paste these leaf prints onto your cake, brush some water behind each piece. Don’t brush too much water coz it gets very sticky and sloppy. 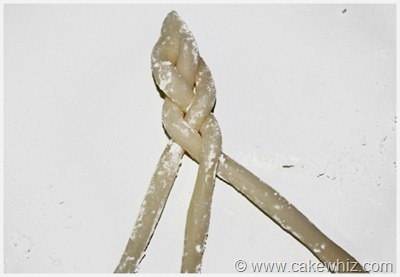 Once again, brush some water behind the braid and stick it around the base of your cakes. You can even see the delicate leaf veination! 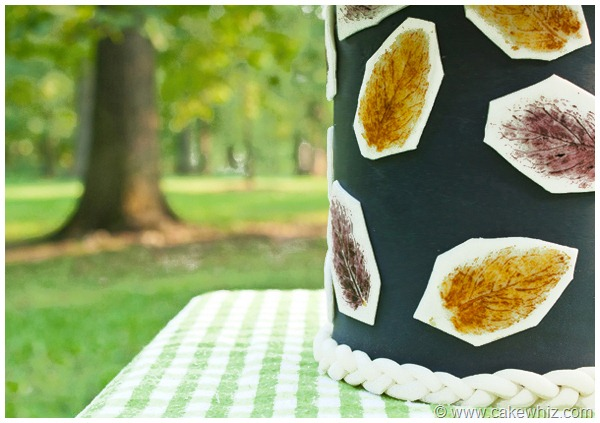 I think this “leafy” cake is perfect way to bid farewell to Summer and welcome Fall. What do you think? And that’s enough yapping from me… I hope all of you liked this cake and I would love to stay in touch with you through either Facebook, Twitter or Pinterest. 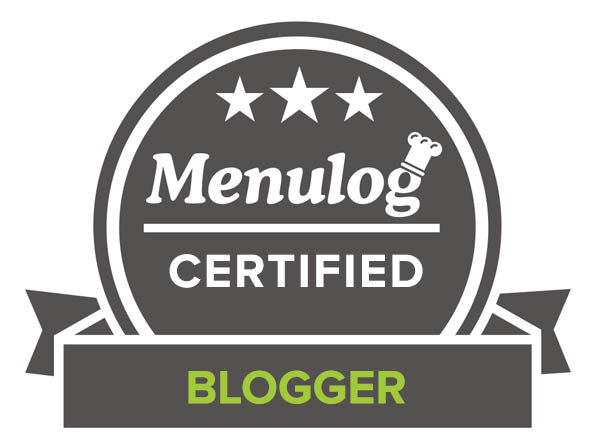 Thanks for having me Uru… doing a guest post here has been a pleasure. Your results were utterly utterly utterly inspiring! Before I leave, I would just like to drop a quick note to one of my best friends, TT, whose birthday was today – SHE TURNED THE BIG 1-7 😀 😀 😀 – Of course, because of that blasted fever thing, I was unable to make her… cheeseburger-spider-concoction (code word guys, don’t worry that is not really it ;)) so hopefully I will be making, giving and posting it to – HAPPY BIRTHDAY MY OREO-OBSESSED BUD! I tried a chocolate cake with spinach and it was delicious. I am sure that this recipe is perfect! The decoration is so beautiful!! Abeer, you are a perfect match for guest blogging on Go Bake Yourself. You have an admirable appreciation of chocolate, are willing to experiment (with a veggie, no less!) and you came up with an amazing design. Thanks so much for being here, and, CCU, thanks for having her. Wow-just beautiful! I agree Abeer is an artist. Thanks for sharing. Love the braid details! 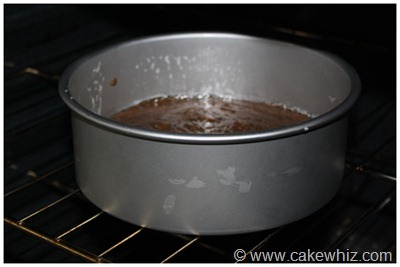 I can tell you I would be a total wreck with fondant – I am way too impatient and fumbly! So pretty–and what an education on decorating technique! Wowzers!! Beautiful and inspiring. Just so cool. Gorgeous cake and with healthy spinach too…. Now that’s worth applauding!!! I have never seen anything like this, gorgeous!! I hope you both have fab weekends. How wonderfully unusual! Love the collaboration and outcome! Love Abeer’s blog. Such a talented baker and artist!! Wow, this is so-so cool! the leaf prints are soooooo pretty! oh my gosh, such a great post! 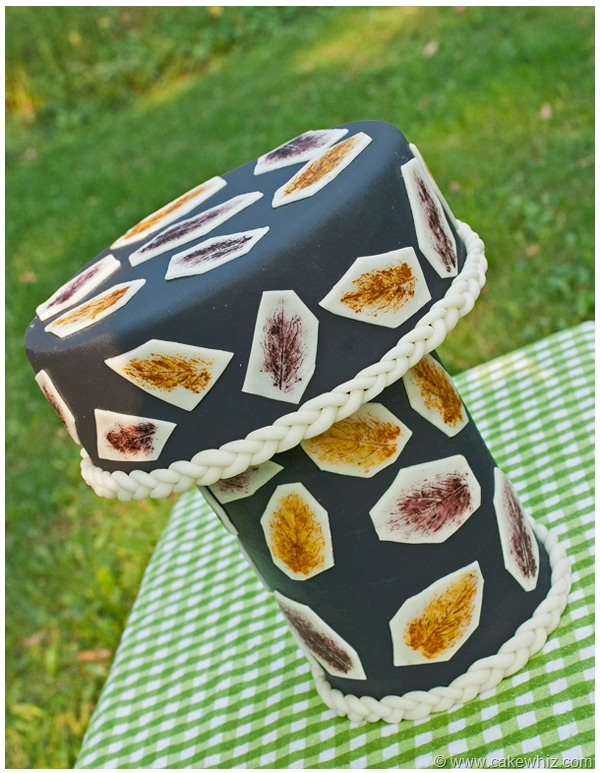 gorgeous and creative cake! A crazy wonderful cake, both of you! Such inventiveness (is that a word or am I inventing it??) Lovely guest post! How lovely! 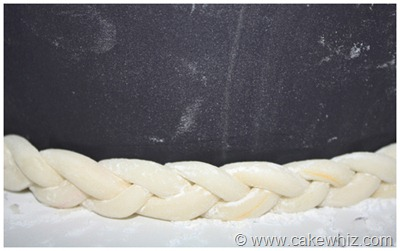 I especially like the braid around the edges of the cake. Oh wow, this is one of the loveliest cakes I’ve ever seen. And just perfect for the Fall that just started in the States. Awesome guest post! This cake is soooo cool!! How creative!! wow! this is so creative! I’ve never seen anything like it! Spinach in a cake? That’s the perfect way to sneak in veggies! Abeer’s detail work is simply amazing – super skillful!! I only wish I lived closer so I can ask to make my children’s birthday cakes. 🙂 Never seen so artistic cakes before I found her blog! Wow! I am really intrigued by the idea of spinach in a cake. I know it must have amazing depth of flavor. The presentation is so original. The cake looks gorgeous and indeed it is a work of art. No doubt she is very talented ,I have seen some of her creations before. What a beautiful cake! I bet the spinach assists in creating a moist cake. Love the leaves! Abeer is a super genius!!! 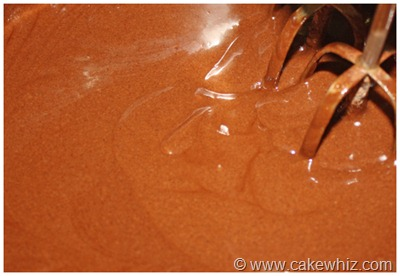 I always LOVE going over to Cakewiz to oogle the goodness. Fabulous guest post. Spinach cake? Sign me up! A chocolate and spinach cake, mmmmm. Not sure but am willing to give it a try. Beautifully decoratd cake, so creative. that is truly original, but it structure and decoration! I have been a huge fan of Abeer for years! 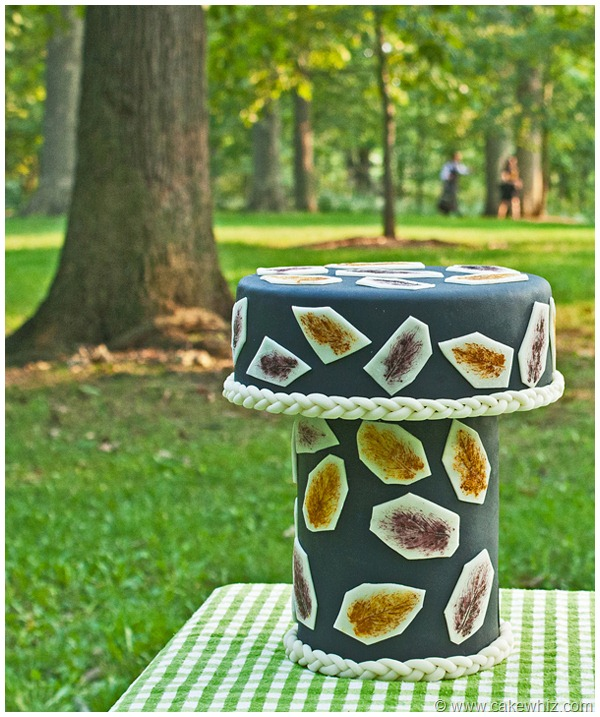 Her work is just amazing…and here is another example of gorgeous cake! I love the braid trim. Great guest post, Uru…have a wonderful weekend! Chocolate and spinach!! Who would”ve thought! Those fondants look awesome!! art and craft, vegetables and cake?? This is the perfect combination for baking with my kids! Nice work. What a great way of hiding vegetables in a cake! 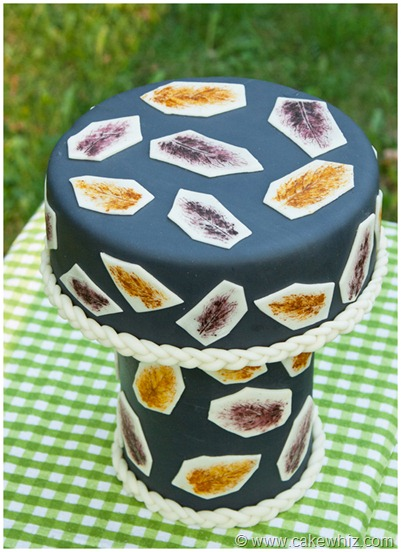 And that is one gorgeous cake… love the imprints. 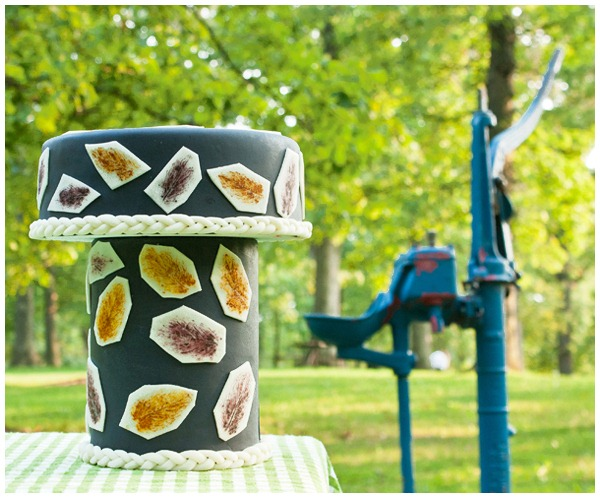 What gorgeous cake and those leaves are amazing! It would be quite hard to eat this because it just too pretty. I wouldn’t know where to start cutting! Can’t believe it has spinach in it! Nice to meet you Abeer! Abeer is great. Her stuff is amazing and this cake is no exception. Great guest post. You are truly an artist Abeer. Great to meet you! I get amazed everyday at the talent we have amongst us….can make us feel pedestrian at times. That is one great looking cake! And I love the spinach add-in. Outstanding! I love it! You are so creative! Spinach in CAKE?! It’s like this recipe was meant for me. I put spinach in EVERYTHING. And now I will add it to cake. This truly is artwork! I would certainly not feel guilty have a large slice of this beauty. Afterall it has spinach in it! Thanks Uru and Abeer. Amazing cake! So creative and with spinach – wow! This is something for me .. but I will only bake the cake .. not all the fancy bits – would take me days to do. Stunning looking cake, you’re some star! Have baked with fresh basil before – and it has become one my favorite desserts now. This I will try very so – will come back to you. I love how the cake looks! Just beautiful – Abeer is truly an artist! Beautiful cake! Interesting with the spinach, but I’m assuming it must make the cake nice and moist. Holy cow. Beautiful job! What an artist. I would love to eat a slice of that 🙂 or maybe, two, so I could get all the extra vitamins and iron from that spinach! Truly beautiful, Abeer is incredibly talented. There are zucchini loaves, why not spinach cake. Love it! Whoa!! Spinach cake?? And the leaf prints – truly over the top! OK, if it’s Cake Whiz we definitely want another guest post. She’s an amazing baker and this masterpiece is no exception. I can’t believe how great she is with decorating things. Very nice guest post. Oh my gorgeous cake! And spinach??? My mind is blown. Wow this is a crazy amazing looking cake. You are very talented!